The Woods So Dark And Deep A dangerous cult has risen in Arkham! Meeting in secret, these heretics and madmen consort with dark powers and offer up sacrifices to the Ancient One, while hordes of vicious monsters descend on the the town. It?s up to a small band of investigators to infiltrate the cult and learn from these dark rituals, yet even the most pure-hearted may find himself corrupted in the process. 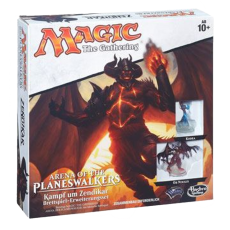 Will their efforts be enough to stop the Ancient One from awakening, or will the investigators succumb, one by one, to the blasphemous seduction of its Herald, the Black Goat of the Woods? 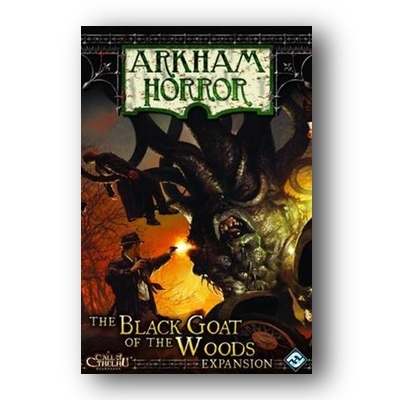 The Black Goat of the Woods is an expansion for the Arkham Horror board game by Fantasy Flight Games. 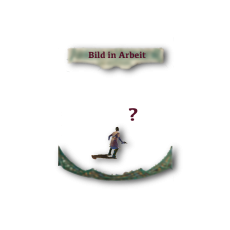 This expansion features 88 new Ancient One cards, 9 new monster markers, 1 Herald Sheet, and 90 new Investigator cards including new items, new spells, and the dangerous lure of corruption?